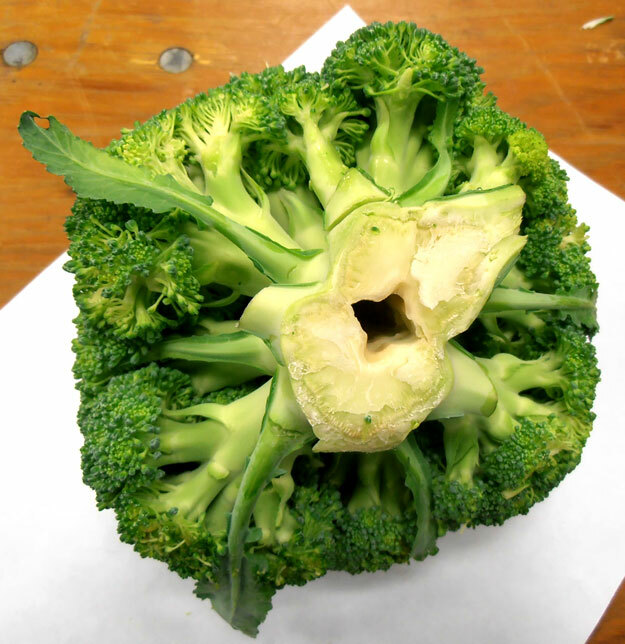 Hollow stems could be caused by a boron deficiency, but not all hollow stems in broccoli are caused by boron deficiency. Excessive nitrogen, or growing conditions favoring rapid growth could cause this defect. That explains why some years you see lot after lot with hollow stems, but other years you may not see this defect at all. Since it occurs while growing, this defect is considered a quality defect, meaning the hollow stem will not increase in size after harvest. The area around the hollow area may become watersoaked, discolored, or may breakdown, as this area is more susceptible to infections. The USDA provides a scoring guideline, but this guideline focuses on bunched broccoli and not the popular broccoli crowns. The USDA states: Score as damage, any hollow stem when the opening extends more than 3 inches up into the stem, or when the opening is more than slightly discolored or watersoaked. 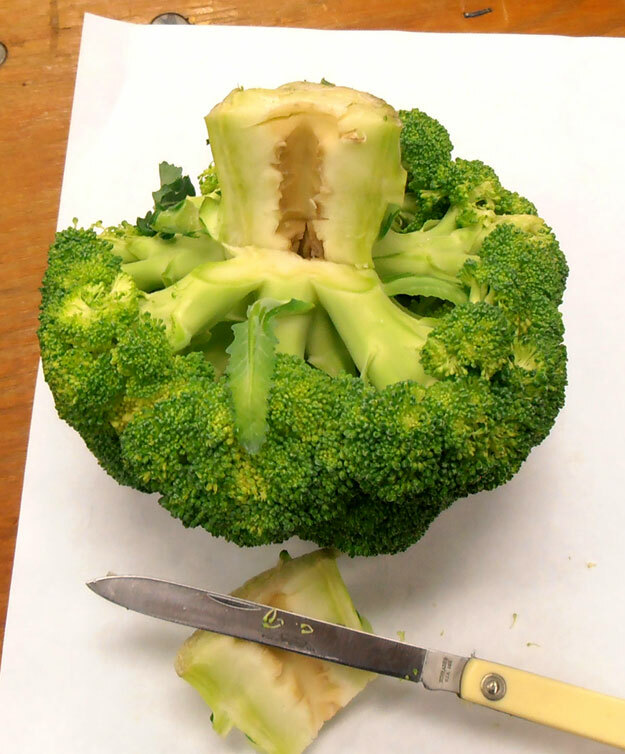 But what do you do if you encounter hollow stems on broccoli crowns and the stem is much less than 3 inches in length? You can never score hollow stems as a defect? No, you would default to the generic scoring guideline, score as damage when the hollow stem materially affects the appearance. As in the above image, cut into the stem and determine how far the hollow stem extends into the stem. Score as damage when the hollow stem extends into the crown area. The U.S. Grade Standards allow for 10% total defects. As I said earlier, this defect may be commonly found, depending on the growing conditions. Some shippers are stipulating in their contracts they will not recognize this defect on inspection reports. As an inspector, always check with your procurement staff and seek thier guidance on whether you should score this defect.